Immune regulation by DC subsets and the influence of complement. (A) Under conditions of immune tolerance to inhaled antigens, pDCs outnumber mDCs. pDCs suppress the generation of effector cells by mDCs by sending an unknown inhibitory signal to mDCs and to T cells (in the form of programmed death ligand-1 [PDL-1] or high level indoleamine dioxygenase [2,3-IDO] activity). The T cell division that occurs in response to partially mature mDCs is abortive (i.e., it does not lead to generation of effector cells) and leads to generation of Tregs. ICOSL, inducible costimulator ligand. 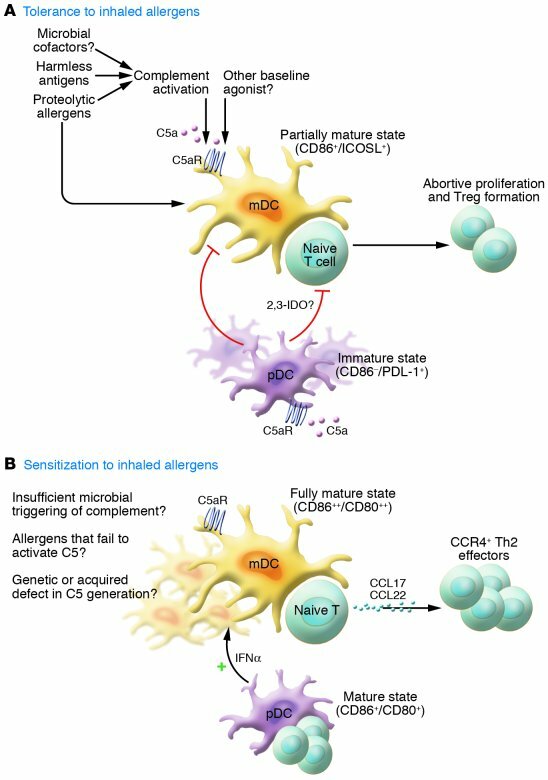 (B) Under conditions that lead to sensitization to inhaled antigens, mature mDCs greatly outnumber pDCs, thus releasing the inhibitory “brake” on T cell stimulation. It is also possible that pDCs become directly stimulatory, subsequently inducing rather than suppressing T cell responses. In this issue of the JCI, Köhl et al. (15) show that, under conditions of C5aR blockade or lack of C5 generation, there is a major increase in the number of mDCs compared with pDCs, leading to Th2 sensitization. mDCs also produce the Th2-selective chemokines CCL17 and CCL22, further intensifying Th2 effector cytokine production. This might explain why C5-deficient mice are more susceptible to asthma. Exactly how complement is activated in response to allergen inhalation is still unknown, but could involve exposure to proteolytic allergens, production of endotoxin by microbes, or baseline activation in the lungs. If microbial factors induce C5a in the lungs, the absence of these might also explain an increase in sensitization with increased cleanliness (hygiene hypothesis).